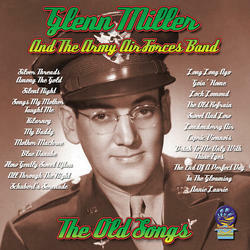 Glenn Miller designed his 1938-42 civilian band primarily for dancing. He designed his 1943-45 Army Air Forces Band for listening. To the usual dance band instrumentation of brass, reeds and saxophones, he added a large string section and French horn. These additional instruments provided his arrangers with extra orchestral colors when scoring the songs which Miller handed to them. The old songs, particularly, benefited from the wide range of orchestral colors, as the arrangers brought out the beauty of their melodies. The arrangers such as Jerry Gray and Ralph Wilkinson have done these old songs proud. Most of the songs on this CD are the “Something Old” tunes of medleys recorded in New York performed by Captain Glenn Miller And The Army Air Forces Band.